Stadio San Siro was a project of former AC Milan president Piero Pirelli. In the first two decades of the 20th century, Milan had already occupied various grounds, and by the early 1920s played at a ground at the Viale Lombardia. 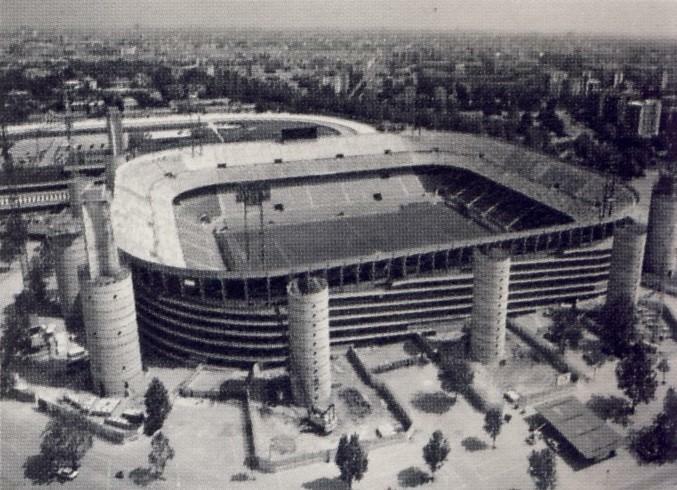 Though a perfectly fine ground, it soon turned out to be too small for the club’s growing number of fans, and therefore architect Stacchini, also responsible for Milan’s central station, was hired to design a complete new stadium. Stadio San Siro officially opened on 19 September 1926 with a friendly between Milan and Inter (3-6). The stadium initially consisted of four separate stands and could hold 35,000 spectators. 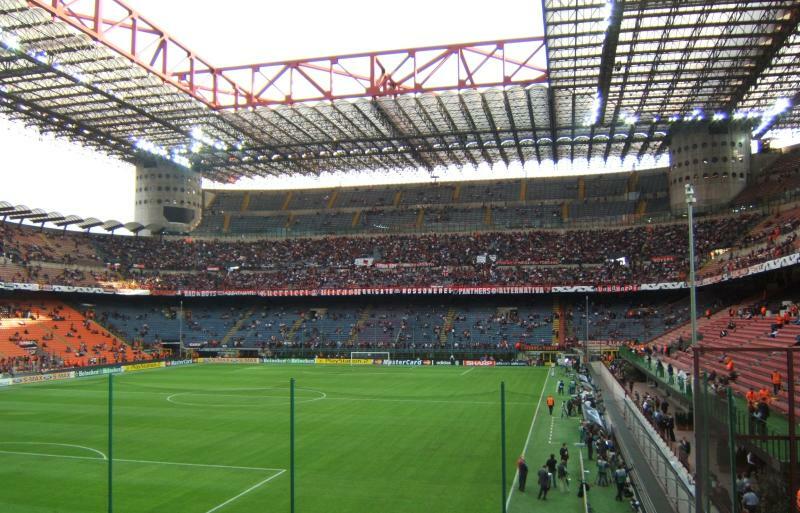 San Siro was first owned by AC Milan, but was sold to the city of Milan in 1935, who were soon forced too enlarge the stadium due to the club’s increasing popularity. Plans were made for a massive stadium for 150,000 spectators, but these were in the end significantly scaled down. 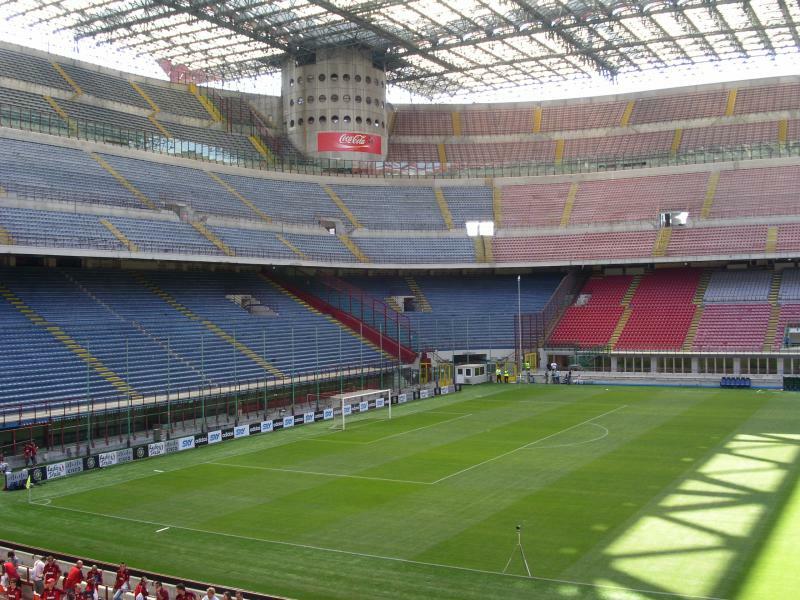 The redeveloped San Siro opened in 1939, and consisted of one fully enclosed tier. 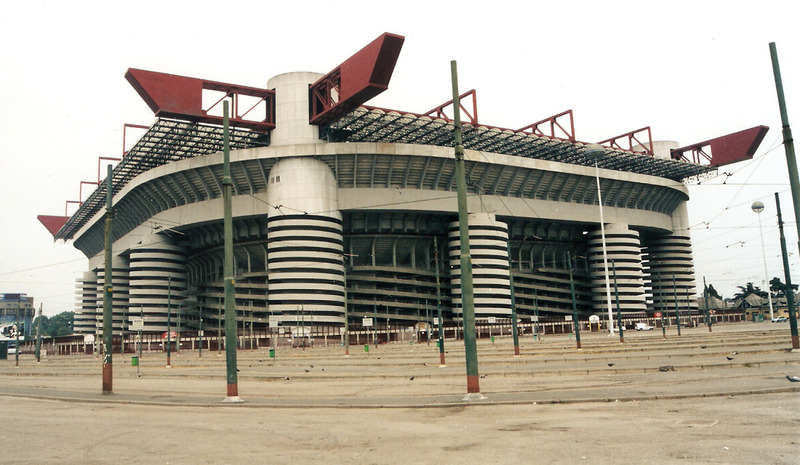 Until 1945, Milan had been the sole occupant of San Siro, but were then joined by Inter, who had before played at the Arena Civica. 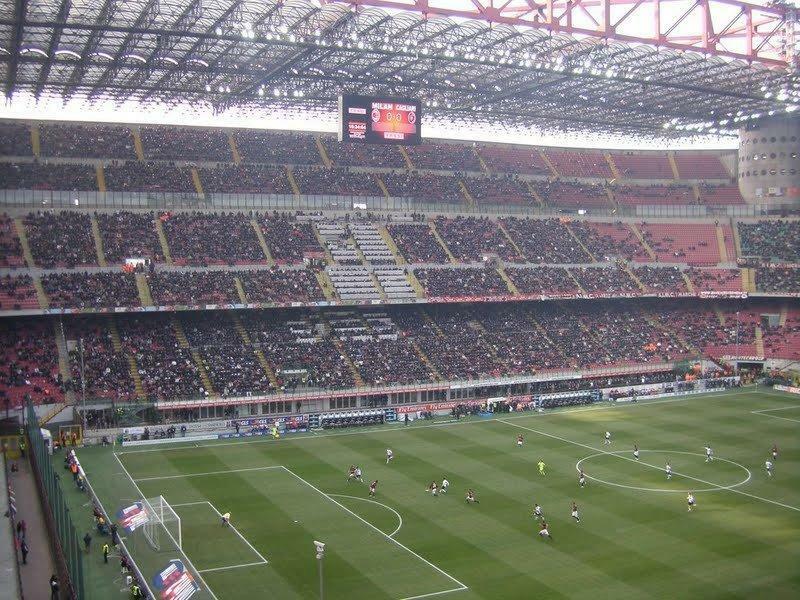 San Siro got further expanded in 1955 when a second tier got built on top of the first one, which resulted in a capacity of about 85,000 places. 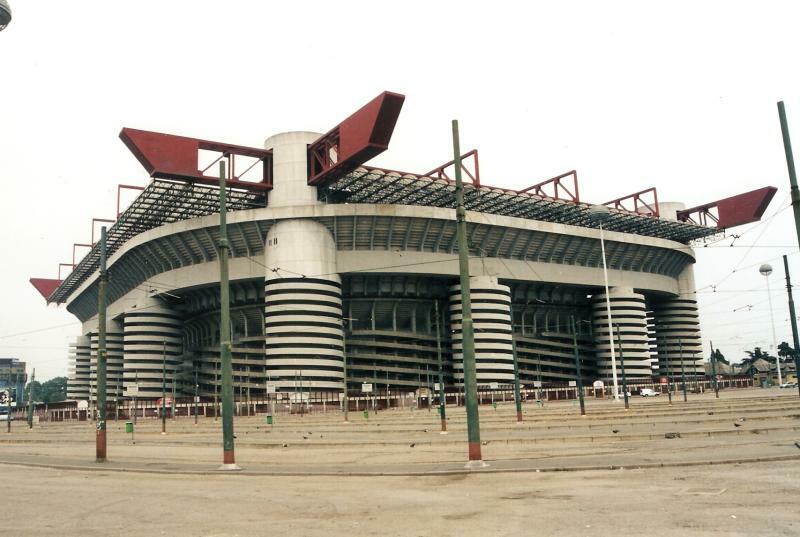 In the following decades, San Siro hosted two European Cup finals: the first in 1965 between Inter and Benfica (1-0), and the second in 1970 between Feyenoord and Celtic (2-1). The stadium had earlier gotten ignored as a playing venue for the 1968 European Championships, but did get selected for Euro 1980. At the same time it got officially renamed Stadio Guiseppe Meazza, in honour of the ex-player of both Inter and Milan. During the 1980 European championships, San Siro hosted three first round group matches. Soon after, Italy got awarded the 1990 World Cup, and it became clear that San Siro was in need of a major upgrade. The option of building a new stadium was contemplated, but architects Ragazzi, Hoffer, and Finzi instead chose for an ambitious redevelopment plan. 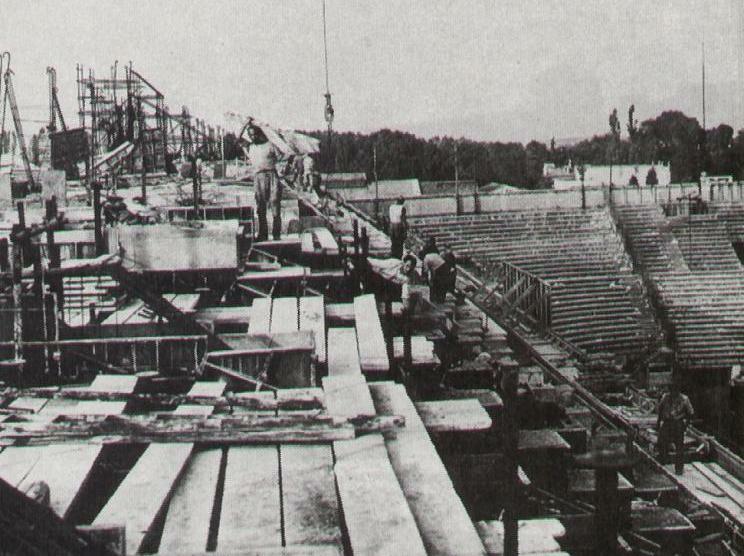 Works included the construction of a third tier, a roof that would cover all seats, and eleven cylindrical concrete towers around the stadium to support the extra tier and roof structure. The resulting capacity was 85,700 seats. 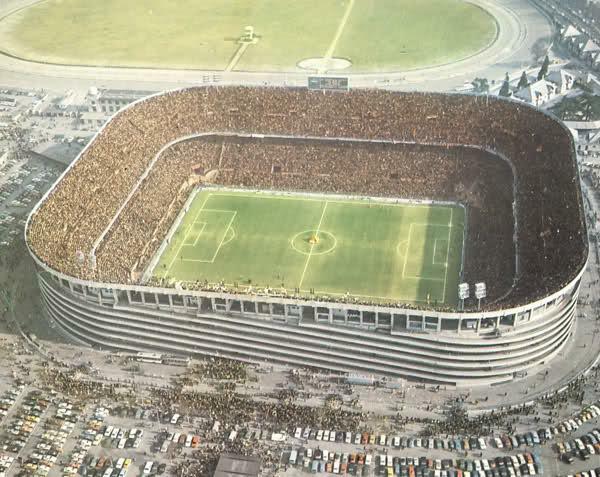 During the World Cup, San Siro hosted the opening match between Argentina and Cameroon (0-1), three further group matches, a round of 16 match, and the quarter-final between Germany FR and Czechoslovakia (1-0). The stadium got further refurbished in later years, and capacity reduced slightly due to UEFA safety requirements. In 2001, it hosted the Champions League final between Bayern München and Valencia (1-1) and in 2016 the final between Real Madrid and Atletico Madrid (1-1). 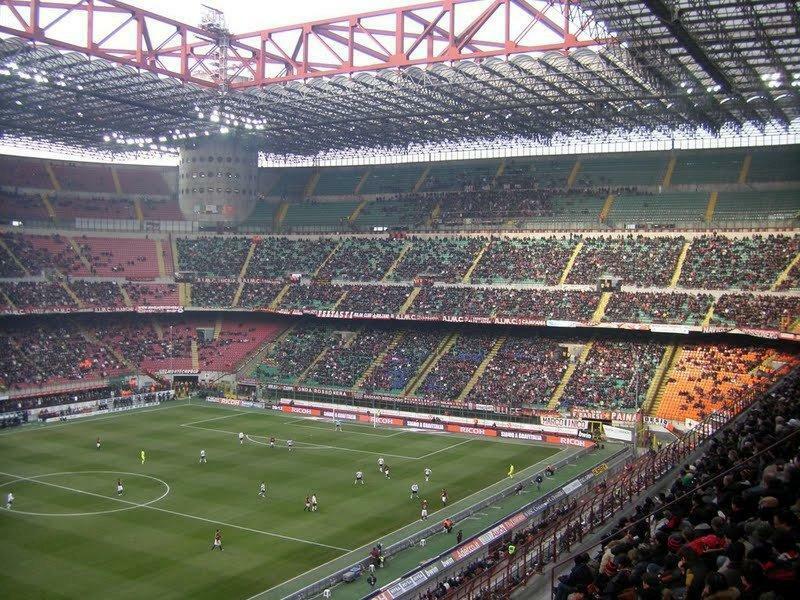 Both Milan and Inter have looked at building a new stadium elsewhere, having found themselves constrained in their development due to the deteriorated state of the stadium and ownership by the city of Milan. 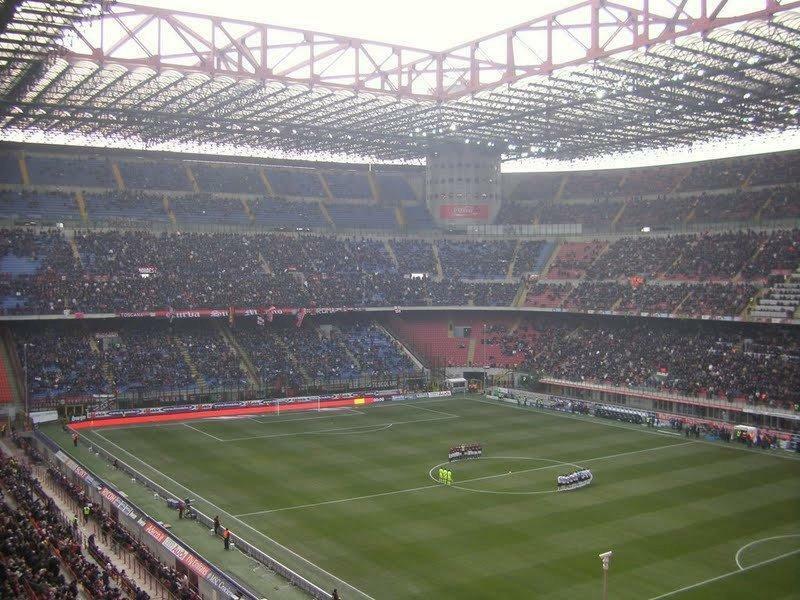 Inter was the first to announce plans to build a new club-owned stadium in 2012, but shelved these when Milan revealed concrete plans to build a new stadium in the Portello area, instead opting to renovate San Siro. However, Milan’s move fell through in 2015 and future plans of both clubs are currently unclear. San Siro is located in the west of Milan at approximately 5 kilometres from Milan’s city centre and more than 7 kilometres from Milan’s central railway station. If arriving by car from the direction of Turin (A4), Genova (A7), or Bologna (Autostrada del Sole), make your way to the western ring road (Tangenziale Ovest) and take exit 3 to the Via Novara. Signs will direct you from the motorway to the stadium. If coming from the direction of Venezia, take the exit towards the Viale Certosa. After the exit signs will guide you to the stadium. San Siro is easily reached by metro due to the recently opened new purple M5 metro line. The nearest stations are San Siro Ippodromo and San Siro Stadio, both a short walk from the stadium. Line M5 passes north of Milan’s city centre past Garibaldi station and from most central places a change will be required either at Lotto (red M1 line) or Garibaldi station (green M2 line). It takes a little under 20 minutes to get from Piazza Duomo to the stadium. Alternatively, the stadium can be reached with tram 16. Take the tram in the centre of Milan (west of Piazza Duomo) to San Siro Stadio, the last stop on the line. The journey takes about half an hour. San Siro is located in a rather quiet residential area, which did not use to offer much in terms of entertainment, but has recently seen a few more bars and restaurants pop up. Still, as the stadium is easy to reach by metro, it makes more sense to eat and drink in the centre or in one of Milan’s other livelier areas, and head to the stadium just for the match. Of course, there are plenty of food stalls around on the day of the match for a quick panino. If you prefer to stay the night close to San Siro and are on a budget, then the recently opened B&B Hotel Milan San Siro will be an excellent pick. It is located right next to the stadium. MI. Style is another budget alternative right near the stadium. There is more choice near Lotto metro station, less than a 20-minute walk from the stadium, including some that offer a little more luxury. Hotel Mélia Milano gets the best reviews, while Hotel Montebianco, Best Western Hotel Astoria, Hotel Nuovo Murillo, and Hotel Amendola Fiera are good options that are a little more affordable. Click here for all hotels near San Siro, and here for further options in central Milan. Tickets for AC Milan games can be bought online through the Milan official website, at the branches of the Banca Popolare di Milano bank, at any of the TicketOne sales outlets, or at the Casa Milan ticket office at the Via Aldo Rossi 8 in the north of the city (closest metro QT8). Tickets are also available at the stadium before the start of the match. 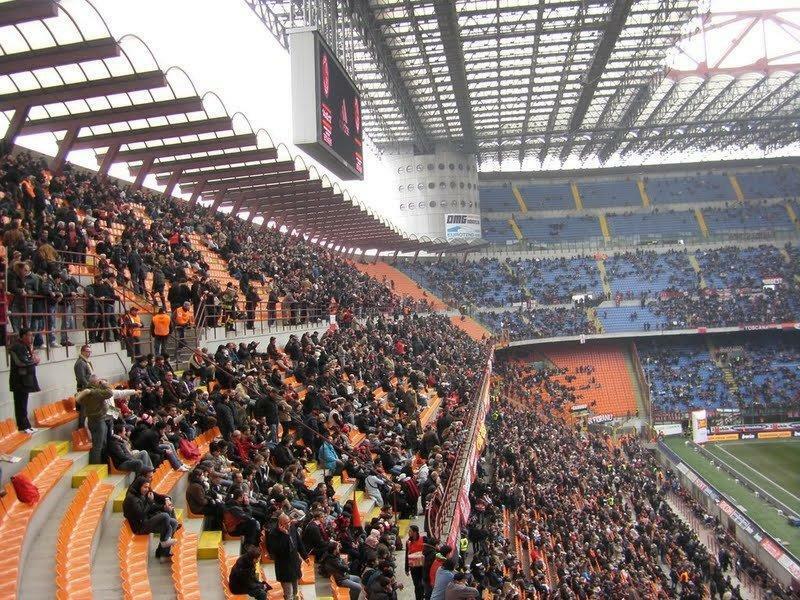 Milan tend to only sell out the home matches versus Inter and Juventus. An ID is required in order to buy tickets. Tickets come in three prices categories. Ticket prices for the cheapest C category start at €20.00 for a seat at the second tier behind the goal, range to €40.00 for the cheapest lower-tier seats at the sides, and range further to €140.00 for a central lower-tier seat at the main stand. Prices for the most expensive Category A games range from €30.00 to €250.00. Tickets for the third tier only go on sale if the rest are sold out. You can find a seating map here. Tickets for Inter matches can be bought online through the official website or Vivaticket, in person at any of the Vivaticket sales points, of which there are multiple in the centre around Piazza Duomo, at the San Siro ticket office, or at the Inter Store (opened Thursdays to Saturdays) at the Galleria Passarella 2 in Milan’s city centre. Tickets are also available at the stadium on the day of the match. Just like Milan, Inter only tend to sell out the derby and the match against Juventus, and an ID is always required to buy tickets. Regular ticket prices start at €30.00 for a second-tier seat behind the goal, range to €40.00 for a second-tier seat at one of the sides, and further up to € 150.00 for central lower-tier seat at the main stand. Prices are gradually increased for a number of high-profile matches resulting in prices ranging from €65.00 to €275.00 for the Milan derby. Tickets may be somewhat more expensive if bought on the day at the stadium. San Siro houses the combined Milan and Inter museum. It also offers guided stadium tours that include access to the dressing rooms, hospitality areas, and press room. The tours last 30 to 40 minutes. The museum opens seven days a week from 9:30 am to 5:00 pm. Tours leave regularly within these hours. There are no or only a few tours on matchdays and different opening times can apply for the museum. Bookings are not required, but can be made online through Vivaticket. The tour + museum costs €17.00, or €7.00 for access to the museum only. For more information call +39 02 4042432 or email tour@milanosansiro.com. ACMilan.com – Official website of AC Milan. Inter.it – Official website of FC Internazionale. SanSiro.net – Official website of Stadio San Siro. Turismo.milano.it – Tourism portal of the city of Milan. ATM.it – Public transport information for the city of Milan. 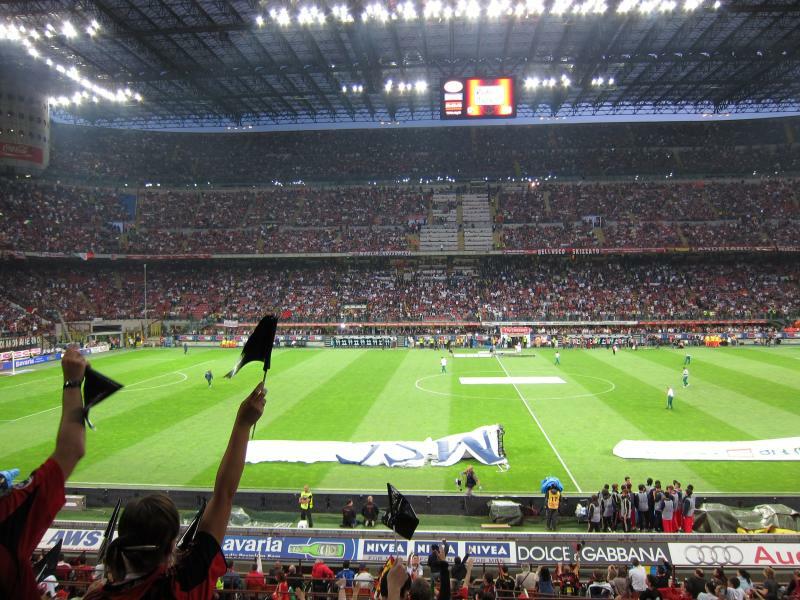 We are US residents, recently made a trip to Milan last week and had a very bad experience… my 15 year old son is a Soccer fan and wanted to really see the San Siro stadium. we were enroute to Switzerland and decided to stop by and show him the stadium. Very sad to say that just to get into the stadium to take few pics with one of your employee, I was told to pay 16$ for my son and also ticket for me, since I had to go with him. I actually paid for him and then ask for refund after I was told to pay for me. Even after talking to 4 individuals nothing happened, very disappointed that my son had to return back home with no pictures, he is fan of your team and the stadium, can answer any question you ask him about your team. It is a-must-see stadium for every fan of football. Despite its age it is very nice. A walk from the metro takes a short while. Because the stadium is used by two teams you can see the visible signs of tear and wear. The area is very quiet and i would recommend it to everybody.